Everyone who sits down to write about catfish in general will mention in the first few paragraphs the immense diversity exhibited by this family of fish. This is rightly so and this diversity is part of the formula of their success, both in the natural world and in aquarists tanks. If you accept there is a successful formula then this month's catfish is a worked example. This fish doesn't sit still under a rock all day, it doesn't grow to a full grown length that would require the conscientious fishkeeper to house it in an indoor pond and it simply refuses to eat, or even nip, other fish. It is, in fact, a true community fish. It spends its time shoaling very closely with its colleagues and these shoals actively drift up and down the aquarium in full view, all of the time. This then is a mid-water catfish adapted to daytime life in flowing water. Upon a time, while touring my collection of catfish, an "unconverted" newcomer to the hobby once exclaimed of the Striped Glass Cat, "It's a normal fish!". Later, while we watched some mollies magically produce live miniature mollies we had a chance to talk some more about our Glass Cat; Normal, I explained to him, is relative. Surely the very essence of fishkeeping is that there is no such thing as a normal fish. So the African Striped Glass Catfish isn't special; however it amuses my warped mind to keep them with more "conventional" benthic catfish in a display tank to add to the mid-water activity. This essentially boils down to a deep rooted desire on my part to keep as many catfish as possible. Because of this I have kept these active little catfish with most common types of community fish and learned that they fit in very well indeed. Most often these catfish are imported and sold as Pareutropius debauwi, often leading to an alternative common name of "debawi cats". This isn't accurate however. The true P. debauwi is rarely imported and has several distinguishing features. 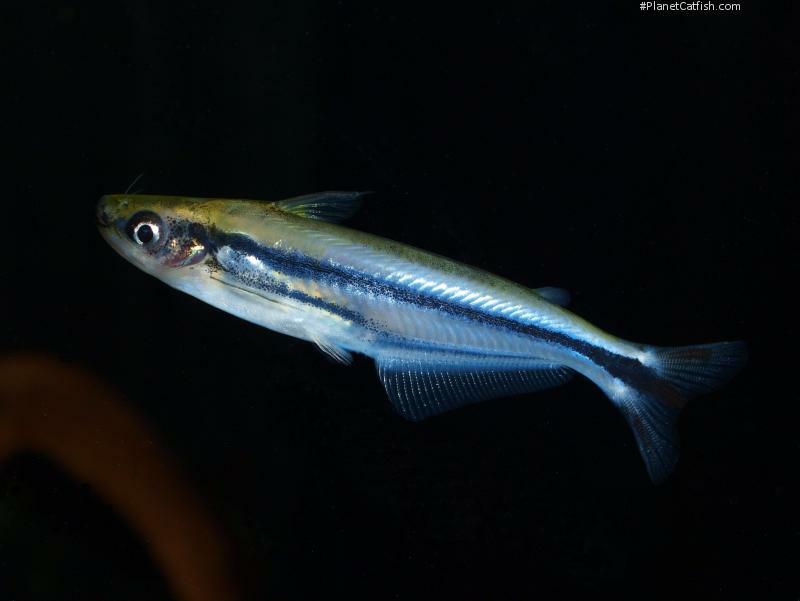 P. buffei has three body stripes, the lower is broken around the pelvic fins and a stripe or spot on each of the caudal fin lobes. P. debauwi on the other hand has one body stripe and clear caudal fin lobes. These are not very good identification parameters however, as telling the two fish apart requires adult fish. Fish less than 1" in length of both species do not have all of these features, for example often young P. buffei have clear caudal fins and a greatly diminished lower stripe."